Did you know the American Psychological Association and the American Psychiatric Association recommend exercise to treat depression? "Exercise…is good for your head. Exercise was a beneficial antidepressant both immediately and over the long term. Exercise was an equally effective antidepressant for both genders. Exercise plus psychotherapy was significantly more effective than exercise alone." 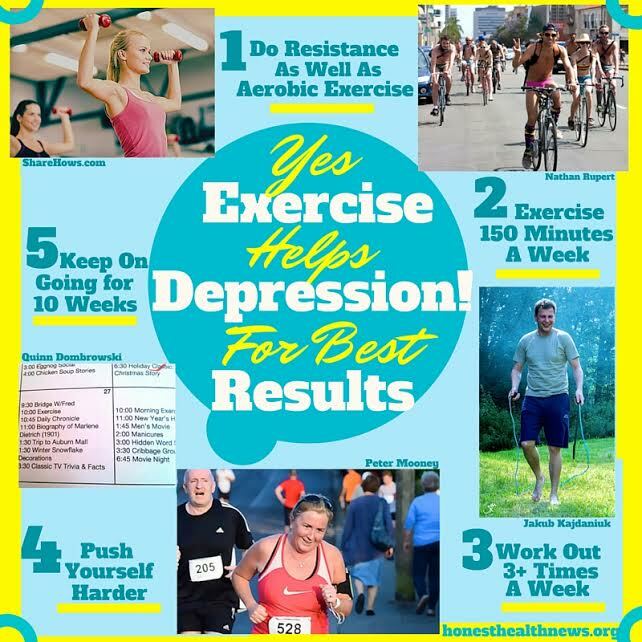 "Exercise is included in the American Psychiatric Association’s [depression] treatment recommendations," writes Dr. Chad D. Rethorst, Department of Psychiatry, University of Texas Southwestern Medical Center, because "research has shown [it's] efficacious as both a stand-alone and an augmentation therapy" (Evidence-based recommendations for the prescription of exercise for major depressive disorder, Journal of Psychiatric Practice, 2013). The exercise evidence isn’t a slam dunk. In 1990 and 2009 the depression-and-exercise study reviews showed significantly reduced depression, but in 2011 and 2013 the results were: "No evidence of benefit in the high quality studies" and "Too slight a benefit in the high quality studies to be statistically significant." In the 1990 review of 80 studies, researchers also concluded, "Exercise was as effective as psychotherapy in alleviating depression." When Duke University researchers randomized 156 men and women aged 50+ with major depressive disorder into 3 groups—aerobic exercise, antidepressants, or exercise and medication—lead researcher Dr. James Blumenthal reported the exercise group had an equivalent reduction in depression symptoms. In other words, exercise was found to be as effective as medicaton for alleviating depression. A 2010 University of Washington Department of Family Medicine study of 28 randomly controlled trials which compared exercise to no exercise, pharmacotherapy, and cognitive behavior therapy found that exercise relieved depression symptoms as effectively as the behavioral or pharmacological therapies. Researchers cautioned: "The small size of these studies limits the ability to detect a potentially important clinical difference." Carol Garber, immediate past president of the American College of Sports Medicine, says:"We'll need a lot more data before we tell people to throw away their medicines." Researchers G.I. Mura of the University of Cagliari, Italy and colleagues reviewed 13 studies that used exercise as an add-on strategy in treating major depression. Although they discovered "methodological weaknesses in the majority [of trials]," their 2014 findings showed "a strong effectiveness for exercise combined with antidepressants." Get Ready, Get Set, Go… How? Mixed exercise (resistance and aerobic) and resistance exercise work better at relieving depression than aerobic exercise alone. A University of Washington study analyzed 23 randomized controlled trials of different kinds of exercises and depression symptoms in 907 adults. The analysis, published in 2010: Resistance and aerobic exercise combined, or even resistance exercise by itself (though there’s less research), significantly reduced symptoms of depression more than aerobics alone. Exercising 150 minutes/week may maximize mind benefits. Garber reports: "Most randomized controlled trials of people who are depressed or anxious show starting an exercise program in the [ACSM's] recommended 150-minute/week range reduces feelings of depression/anxiety. "For example, Duke University researchers found, and reported in 2011: As exercise levels increased, depression symptoms decreased, up until 180 minutes/week. At that point the association dropped off, suggesting, researchers said, "the antidepressive benefit of moderate-to-vigorous exercise may diminish after an average of about 3 hours per week. "Garber adds that a "surprising finding" emerged in a study she conducted of 263 men and 641 women: "a very large increase in depression and anxiety among those who exercised considerably more than 150 minutes. Now, these are association data, so we can’t say that over-exertion leads to depression or anxiety… Some literature associates more excessive amounts of exercise with obsessive-compulsive behavior and eating disorders." Exercising more frequently—at least 3x/week—may be more effective than exercising less often at the same number of weekly minutes. In one small randomized trial, 23 depressed adults who exercised 3 to 5 times a week—30-minute sessions at 60% to 80% of maximum heart rate—over an 8-week period had significantly larger reductions in depression symptoms compared with their counterparts who exercised only once a week, and by the trial’s end, most of them were no longer depressed.But, a 12-week 2005 study which compared 80 adults aged 20−45 with a mild — moderate diagnosis of major depressive disorder found that both groups benefited from exercising either 3 days or 5 days per week (same 150 minute total), with no differences between groups.Perhaps this means that 3 is the magic number. 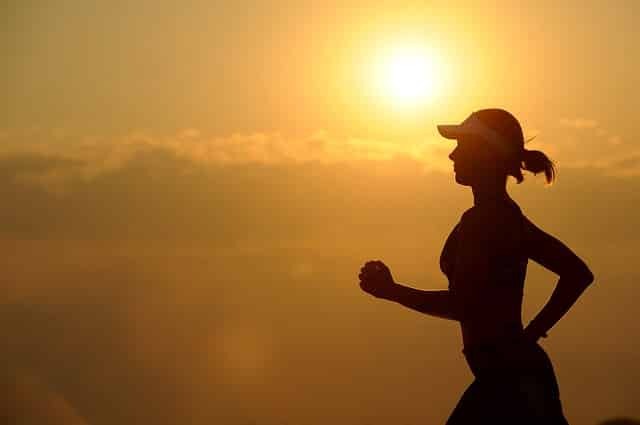 "Exercise at least 3x a week for 45−60 minutes" is in fact Dr. Chad Rethorst’s prescription in Evidence-Based Recommendations for the Prescription of Exercise for Major Depressive Disorder. Harder workouts may be more effective. Researchers conducting a 1990 meta-analysis of 7 studies comparing an exercise group to an easier exercise group concluded: "The easier exercise was not an effective anti-depressant." Dr. Rethorst’s analysis of studies ranging from 50% to 85% of maximum heart rate, however, didn’t find intensity affected depression relief.Workouts, then, may need to be harder than that to demonstrate a difference. For overall health, the American College of Sports Medicine recommends 150 minutes/week at 64% - 76% of maximum heart rate, which should feel "fairly light to somewhat hard," or, alternatively, one or more hours weekly at 77% - 95% of maximum heart rate, to feel "somewhat hard to very hard." Keeping up the exercise—for at least 10 weeks—steps up the results. It takes time to build up a fitness level that makes exercising enjoyable and leads to improved outlook. Dr. Rethorst notes that while reductions in depressive symtoms have been observed in 4-week exercise studies, his meta-analysis found larger effect sizes in trials of 10 weeks or longer compared to 4−9 week trials.Perhaps, then, the mixed results of the exercise trials/analyses might be because the studies didn’t integrate all 5 best practices. More research is needed.But for now, these facts are clear: An exercise prescription does work for a number of depressed adults, often comparably to other depression treatments, and especially well in conjunction with psychotherapy and medication. It’s why the American Psychological Association says, "Exercise is good for your head." Joy Weinberg is editor-in-chief of Honest Health News, from which this article was adapted. For more independent, evidence-based, health living news and investigations, like and connect with Honest Health News on Facebook and follow on Twitter @honesthealthnws. ⇐ What Would Sisyphus Do?